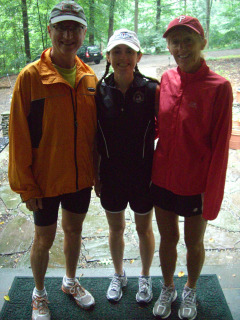 A year ago, my French parents decided they would run their final marathon in Boston. Many American runners can only dream of qualifying for the prestigious footrace, but Simone, 68, and Alain, soon to turn 67, are fast enough in their age group to be participants. They are both endearingly unaware of what remarkable runners they are. The plan was simple, a memorable family affair. In 2015, they would fly to Boston in April. It would be Simone’s 21st and last marathon; Alain’s 23rd and last marathon; and my 10th marathon, including six in Boston — hopefully not the last one. There will be one notable difference between the plan and its execution. I will not run the entire marathon. A lower leg injury ended my training on Valentine’s Day after a painful and miserable 5k race (Talk about heart break). I stopped running altogether from Feb. 15 to March 26, when I was allowed to run 1 mile, no more. I have since ramped up my mileage so I can at least be at the start and run the first half before dropping off. Past the initial sadness and anger, I see this injury as a blessing in disguise. This is another chance to run (part of) a marathon with Alain and Simone, 13 years after my marathon debut in Paris. 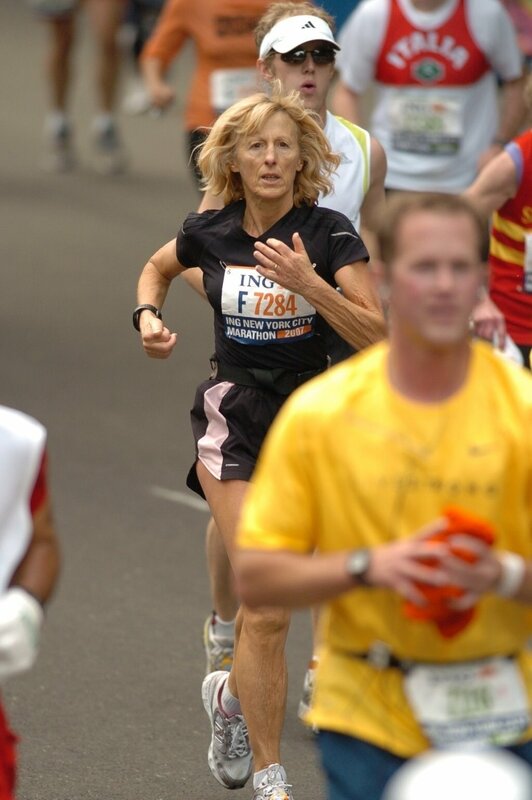 In 2002, I ran my first marathon with my parents (Alain ran ahead while Simone and I stayed together most of the race). In less than a week, I will be at the start with my parents on their last marathon. A looping of the loop. It is also a unique opportunity to visit Boston without enduring the debilitating pre-race jiggers. With the pressure off, I can concentrate on enjoying the moment. Alain, who grew up in the city of Lyon in the 50s and the 60s, didn’t practice any sport until he moved with Simone to the Alps in 1974. The 26-year-old city boy picked up cycling on the picturesque roads of the region during the summers. Simone, who grew up in small towns in the Alps, didn’t do any physical activity until 1978, when they rented a chalet in the mountains with another couple. She was 31, the mother of two toddlers. She followed her friends, both athletes, for rides up the hills on an old rusty bike they’d loaned her. “It was hell,” she said. “It didn’t deter me.” There started her love affair with sport: when she came back home, down in the valley, she started running. Simone was the only runner — let alone female runner — in our rural village of 2,000 in the late 1970s (“People thought I was a lunatic,” she said). Alain, who couldn’t bicycle in the winter, soon joined her. In the household, typical Sunday mornings would have both parents disappearing for a couple of hours with the family dog, Réglisse. The dog would be out of control the second they’d get the running shoes out of the closet. For that reason, we would also never pronounce the word “footing” and only use the codename F-O-O. Cartesian Alain says his worst marathon memory is, “logically,” his slowest: 4h20, sick, in his hometown of Lyon in 2006. “I had fever and thought I’d never finish. I started to walk after kilometer 25 and finished in agony.” Note that he did finish, and that 4h20 is a respectable time for many younger runners. Lessons: Don’t run sick. Don’t start too fast. My mother puts enormous pressure on herself and gets sick before every race: fever, stomach sickness, among others. I, too, suffer from psychosomatic ailments pre-race. 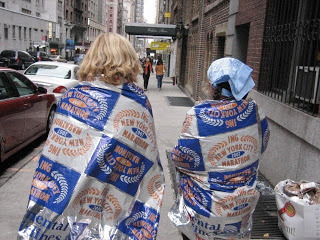 The day before the 2007 New York Marathon, as I was limping around with acute pain in my right toe nail, my mother, who had a sore throat, told me: “It doesn’t get better with age. I still get sick before races as if my life depended on it.” (Nail and throat were fine as soon as we started running. Simone placed 10th in her age group that year, and I had a personal record). Simone and Alain won’t stop running. They’ll just stop running marathons. And they’ll keep cycling, cross-country skiing, daily stretching, walking with Ben the dog. (And Zumba classes for Simone). Alain: You need to start with shorter distances: 10k, half-marathon. Then you’ll get naturally to the marathon, or even ultras. If I, who wasn’t into sports in my youth, was able to run marathons, anybody can do it. Simone: A big part of the marathon is mental — provided you also trained for it. You’ve got to be motivated. I think all marathon runners are people who are driven. If you can walk and are generally healthy, you can run. 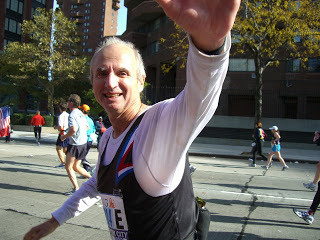 Alain: After running New York twice, Boston was the other mythic marathon, and it’s an older race.